Malaysia, who won the boys' singles and the bronze medals in the boys' doubles, girls singles and mixed team last year, is confident of reaping success again in this year's Pembangunan Jaya Raya Badminton Asia Junior Championships to be held in Bintaro, Jakarta from July 14-22. The mixed team championships will be held from July 14-17 while the individual events will take place from July 18-22. Last year Malaysia won the boys' singles title through Leong Jun Hao who beat China's Bai Yupeng 21-6, 20-22, 21-17 in the final. Malaysia also won bronze medals in the girls' singles through Eoon Qi Xuan, the boys' doubles (Chia Wei Jie-Ng Tze Yon) and the mixed team. "Some of our big names are missing but I am confident that we are still capable of coming back with honors despite the absence of Jun Hao and former world junior champion Goh Jin Wei. "I am confident that the players picked for the Asian Championships are capable of pulling off some surprises," said Malaysia's youth coach Kwan Yoke Meng, a former Malaysia Thomas Cupper. 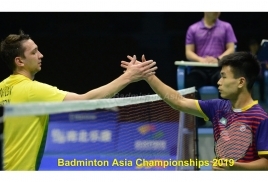 Qi Xuan, together with Tze Yong-Wei Jie is still with the team. Also named to the squad is Ooi Jhu Dar, runners-up in the Smiling Fish Junior International. Leading Malaysia's charge will be Dutch Junior Open girls' champions Pearly Tan-Toh Ee Wei. Boys: Ng Tze Yong, Lim Chong King, Chia Wei Jie, Choong Hon Jian, Chang Yee Jun, Chua Yue Chern, Lwi Sheng Hao, Ooi Jhu Dar. Girls: Eoon Qi Xuan, Go Pei Kee, K. Letshaana, Pearly Tan, Toh Ee Wei, Yap Ling, Eng Sin Jou, Teoh Lexuan.